Police have demanded that thousands of protesters blocking the Polish parliament building in Warsaw disperse, warning that otherwise force may be used. The opposition initially blockaded the parliament building in protest at new media restrictions on covering its work. The protests were triggered by new proposals put forward by the ruling Law and Justice party to limit media access to parliamentary debates. According to the new rules, only five TV stations will be permitted to cover the sessions. The proposal also envisaged limiting the number of reporters allowed in the premises. The move has drawn strong criticism from independent media and opposition MPs, who attempted to block the key vote on budget by occupying the parliamentary podium in protest against what they see as a clampdown on the media. The statement issued by Poland’s independent news outlets argued that the restrictions “do not hit journalists, but the rights of citizens to be fully informed about what people elected by them to the parliament do,” as cited by Reuters. — Artur Warcholinski (@awarcholinski) 17 декабря 2016 г. Police forcefully pulled away protesters and reportedly used tear gas to clear the way for Kaczynski and several other senior members of parliament, who left the scene in a vehicle. Kaczynski’s car was seen leaving the building secured by a convoy together with the car of Prime Minister Beata Szydlo. The use of tear gas was reported by opposition MP Jerzy Meysztowicz, who spoke with TVN24. Earlier, the protesters demanded that Kaczynski personally come to listen to the crowd’s grievances. The Civic Platform along with other opposition parties, liberal Nowsczesna (Modern) and the Polish People’s Party (PSL) issued a joint statement, accusing parliament speaker Marek Kuchcinski of violating the Constitution with his decision to hold the vote in another place. “The [vote] was illegal, period. This is a constitutional crisis,” Grzegorz Schetyna, head of the main opposition center-right party, Civic Platform, said on Twitter. “Everybody sees that Law and Justice has crossed a certain line and nothing will be the same anymore,” Tomasz Siemoniak, Civic Platform’s deputy leader, told journalists speaking outside the parliament’s building. The Law and Justice party insists that moving the vote to another chamber was in line with the law and that it should be considered legally binding. “What the opposition did was a scandal. And we were working,” Jaroslaw Zielinski, a Law and Justice party MP, told Reuters. The hashtag #WolneMediawSejmie (Free Media in Sejm), which has become the slogan of the protesters, is trending on Polish-speaking Twitter feeds, with thousands supporting the action. Warsaw police spokesman Mariusz Mrozek subsequently denied reports that police had deployed tear gas against protesters, claiming that what might have looked like tear gas in fact was smoke from fireworks thrown by demonstrators, according to Gazeta Wyborcza. He also said that after midnight the rally was treated by police as an illegal gathering. In the meantime, the majority of protesters left the area, with only small groups of young people remaining near the building as of early Saturday morning. Gazeta Wyborsza reported that some opposition MPs followed up on their promise to stay up all night in Parliament, refusing to recognize the decision by Kuchcinski, who they argue unlawfully interrupted the parliament’s session. The opposition parties earlier called on the speaker to convene the parliament again on December 20, arguing that the quorum was not observed on Friday. They claim it was not clear who had actually voted as there were some people present during the voting procedure who were not MPs. "There is no proof that a quorum of lawmakers was present. We suspect that people who were not allowed to vote took part," Reuters cited Ryszard Petru, leader of the Nowoczesna party as saying. Earlier, it was reported that the EU Parliament might strip Poland of voting rights due to its government’s encroachment on another civil right, the freedom of assembly. 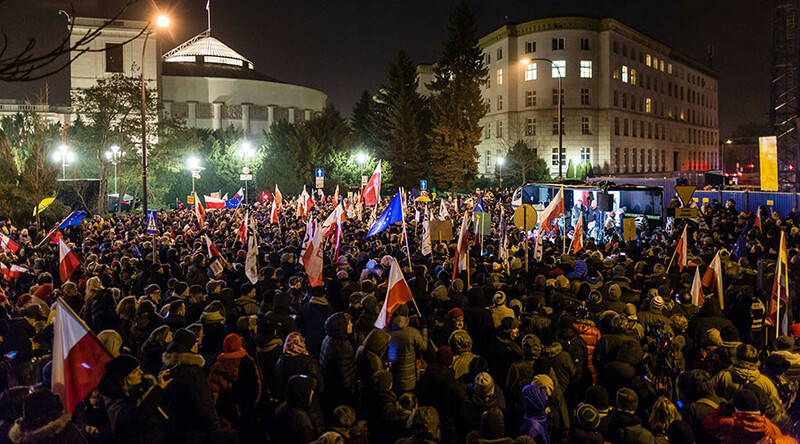 The legislation, which was proposed by the ruling Law and Justice party and already passed by the Polish Senate, envisages that some rallies that the authorities deem “nationally important” can be prioritized over other rallies. The law also stipulates that any group will be entitled to “book” a place to stage “periodical” rallies for up to three years, subject to the consent of local authorities. Any other rallies, organized by other groups at that time and place would be considered illegal. The legislation was blasted by the Council of Europe, the Organization for Security and Cooperation in Europe (OSCE) and scores of non-governmental organizations. The Polish Supreme Court opposed the bill, while some 200 Polish human rights groups and NGOs called on President Andrzej Duda to impose a veto on the legislation, which is pending his approval.